IgA antibody is the most abundant antibody class in human serum and has a unique role in mediating immunity. IgA is a polyvalent antibody that is translocated to mucosal surfaces as the first line of defense against infections. Most of the secreted IgA lines the mucosal surfaces including respiratory, digestive and genitourinary tracts to protect against pathogens while maintaining gut homeostasis. The importance of IgA in pathogen defense is highlighted by the numerous mechanisms used by pathogens to neutralize sIgAs, including sIgA-binding proteins and sIgA-specific proteases produced by certain penumococci, neisseriae and haemophilus species of bacteria. IgA antibodies consists of heavy (H) and light (L) chains. Each H chain is comprised of the Constant region (Cα1, Cα2, Cα3), hinge region and the Variable (V) region. Light chains consists of the CL and Vκ or Vλ elements. Altogether the combined molecular weight of IgA antibody is ~160kDa. IgA antibodies possess a unique 18-amino acid tail piece at the C-terminus of the H chains which is key for oligomerization. As in the case of IgM antibody, IgA antibody monomers routinely dimerize with the help of a 15kDa J chain. The secreted form of IgA (sIgA) is usually dimeric and contains an additional 80-85kDa component. Human IgA antibodies bind five different receptors that serve various functions . See table below for details. Binding is in the 55nM range. Upon engagement with pIgR, an 80kDa polypeptide chain from pIgR (secretory component) is transferred to IgA and becomes part of the sIgA molecule. 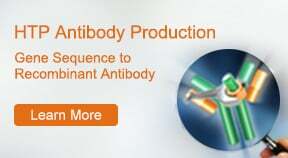 There are two potential advantages of using IgA antibody as therapeutic. Mucosal target: If the site of action is mucosal rather than in the blood, a dimeric sIgA may be a suitable approach. An advantage of sIgA in a mucosal setting is the protection from proteolytic damage, offered by the secretory component (SC) which physically wraps around the IgA Fc region. FcαRI binding: The ability of IgA to bind FcaRI found on neutrophils and other cytotoxic immune cells allows neutrophil and monocyte-dependent phagocytosis. 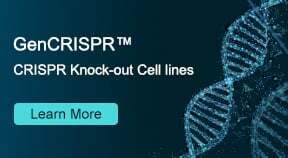 GenScript production team scientists can produce a variety of antibody formats including IgG, IgA, IgM, Bispecific IgG, scFv, BiScFv and Fc fusion proteins. 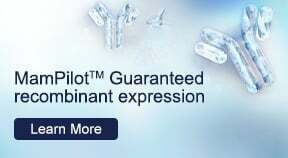 GenScript scientists perform a variety of optimization experiments and leverage years of collective experience to achieve high yields and deliver high quality antibodies to clients. A generic IgG1 production scheme is listed below followed by gel images of IgA production. In order to protect client and project information, experimental details and optimization parameters have been withheld. IgG Antibody Gene Synthesis and Subcloning: After customer's approval, target DNA sequences are designed and synthesized. 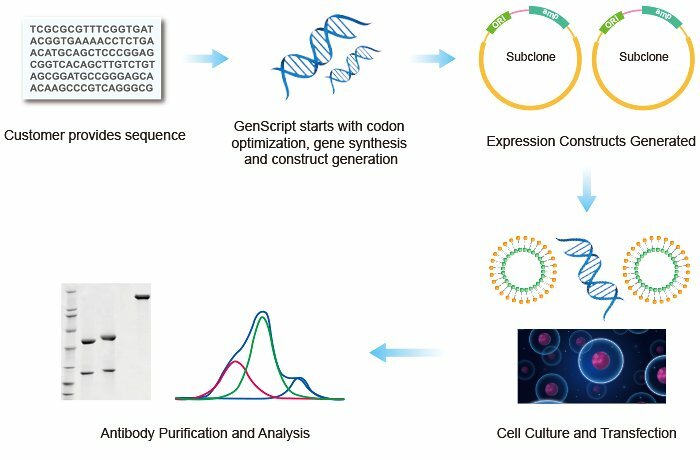 Synthetic genes are subcloned into a GenScript proprietary vector for expression. IgG Antibody Cell Culture and Transient Transfection: Typically, GenScript scientists use either HEK293 or CHO cells, for recombinant antibody expression . Cells are grown in serum-free media. Recombinant plasmids encoding H and L chains are transiently co-transfected to suspension cell cultures. Cell culture supernatant is collected on day-5, post-transfection for SDS-PAGE analysis, in order to evaluate expression levels. 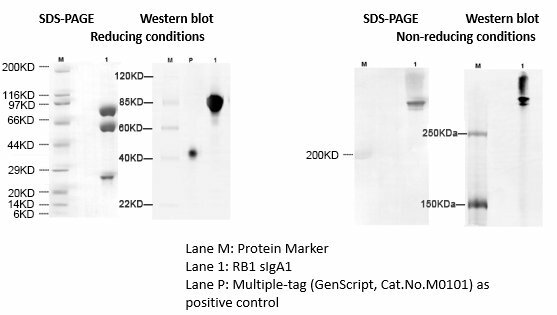 Purified IgA Antibody SDS-PAGE and Western Blot under reducing (left) and non-reducing (right) conditions. You can also view our Recombinant Antibody Service Selection Guideto identify services that are the best match for your application.